There’s a theory that Homo sapiens defeated the Neanderthal, if he did, with a host of superior skills and qualities. One was the development of so-called projectile weaponry: artifacts that could be thrown from afar to bring down a bison or enemy. Neanderthals had spear technology – even bonobos do, but they are believed to have used the weapon personally and up close, gripping the shaft and stabbing. The relatively puny humans developed lighter spears that they could throw from a safe distance. But bows and arrows were a whole other phase in the evolution of remote killing, requiring a higher level of cognitive functioning. Still, the question is when bow and arrow technology arose. Now a paper in Antiquity, published by the Cambridge University Press, analyzes a 61,700-year-old sharpened bone artifact originally found in a South African cave 10 years ago, and concludes it was actually an arrowhead. This arrow technology from the Middle Stone Age found at Sibudu, which is in the KwaZulu province, predates anything found in Eurasia by well over 10,000 years. The earliest artifacts thought to be hafted projectiles (i.e., attached to a handle or strap) are stone points about 500,000 years old found in Kathu Pan, South Africa, and 400,000-year-old spears made of miraculously preserved wood found in Schöningen, Germany. Both predate the evolution of Homo sapiens, inventor of the projected weapon – which, point out Lucinda Backwell of the Instituto Superior de Estudios Sociales and colleagues, are found in every human culture. In southern Africa, bones were known to have been modified into hafted arrowheads in the Late Stone Age. The bone point found at Sibudu Cave is earlier, dating to the Middle Stone Age. Of course, not every ancient modified sharp bone thing is an arrowhead, as Justin Bradfield of the University of the Witwatersrand noted in 2016. Some were clearly used in woodworking or processing animal skins, going by residue and wear analysis. In favor of the Sibudu artifact being an arrow tip, it has a marked similarity to bone arrowheads used in the 20th century by San hunters. It was clearly modified using stone tools. And more to the point, earlier research noted that impact cracks in the implement support its use as a weapon, not some domestic doohickey. One conundrum regarding the Sibudu bone point is that it was found in a hearth, and shows heat marks. However, based on replicating, using and analyzing bone-tipped arrows, the archaeologists concluded that first it had been used as a weapon component. Later it was either discarded or accidentally dropped in the cave fire. 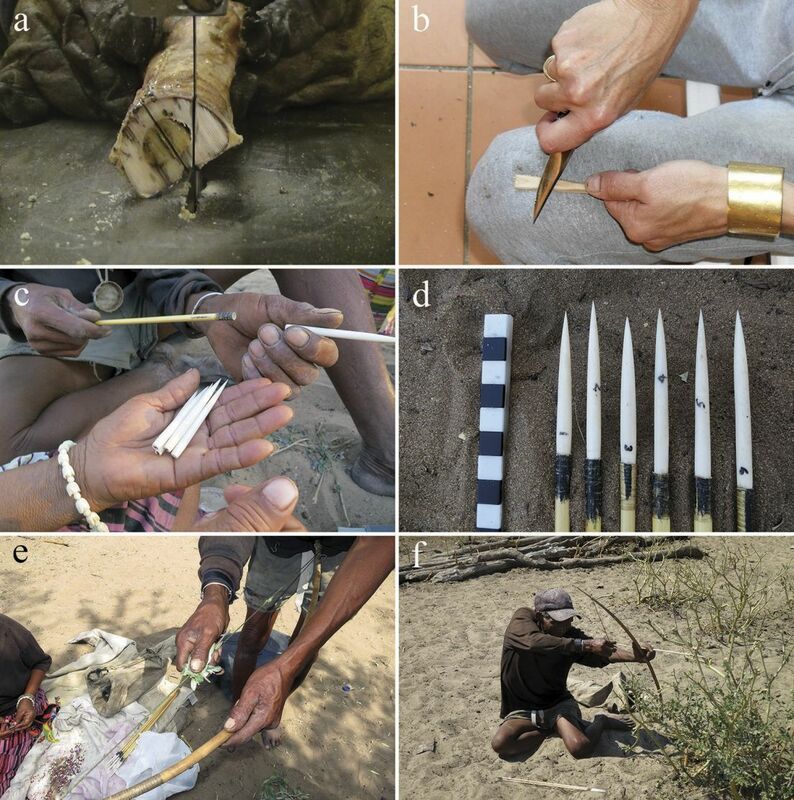 To test if the 61,700-year-old bone point bore the marks of use in hunting versus some tamer employment, the researchers replicated seven bone arrowheads, using fresh bone from elands (a large antelope), secured to reed shafts with animal sinew. The tips were scanned before and after, to eliminate cracks caused in the bone during manufacture. They made bows of local wood strung with kudu tendon, and shot six of the arrowheads into a dead goat. They did so repeatedly, from different distances, once hitting a tree by mistake (sadly, that arrow tip broke, which messed up its crack patterns). The purpose of the simulated hunt was to observe the arrowheads’ internal damage from impact. The seventh arrowhead was heated and dried, to check whether desiccation could have been responsible for the internal damage. Distinguishing between desiccation micro-cracks and impact micro-cracks is not trivial. The team set out to provide criteria to make that distinction. The Sibudu bone point had two kinds of micro-cracks, one older than the other, based on mineralization. These mineral-filled older cracks are most like cracks produced by impact when hunting, they write. 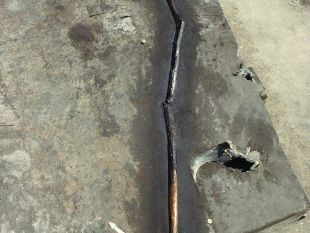 The later micro-cracks appear to have been caused by heat. Conclusion: Some 61,700 years ago (plus-minus 1,500 years), people at Sibudu Cave used fresh bone to make arrowheads for hunting. Then one got lost or was disposed of in a hearth. There it suffered light burning, not utter charring, or this earliest example of bowhunting would never have been found.